Apple may be planning to launch the iPhone 6 on Tuesday, October 14 as the month itself will be an incredibly busy one for the company, according to a source that spoke to MacRumors citing an internal Apple Retail Store meeting. The source notes that a senior Store Leader mentioned October 14th as being an "immense" day for Apple, adding that the whole month of October would be very busy for stores and the company itself. Apple is also said to planning a media event for Tuesday, September 16, coming a month ahead of the device's launch. To this point, most reports have pointed to a September announcement and launch for the iPhone 6. However, a report last week claimed that Apple is planning a mid-September event for the iPhone 6 and iOS 8, which would be followed by an October event showcasing the iWatch, OS X Yosemite, new iPads, and new Macs. An announcement event for September 16 would also fall on a Tuesday, which is when Apple typically announces new products. Apple launching the iPhone 6 on a Tuesday would be a change from past years, as the company has launched previous iPhones and most new hardware on a Friday. However, the source claims that high customer demand and an ample supply due to a large production effort will motivate Apple to start iPhone 6 sales earlier in the week. It is unknown if an October release for the iPhone 6 would include both the 4.7-inch and 5.5-inch version, as recent rumors have pointed toward several production issues plaguing the larger model. 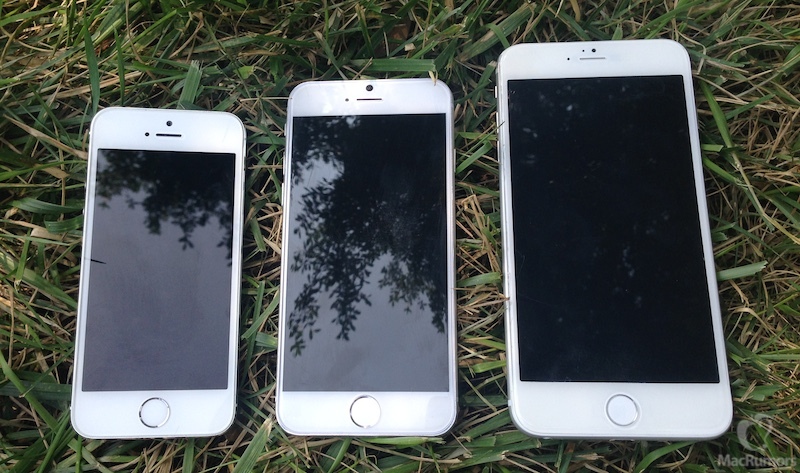 It is possible that the 5.5-inch may launch later in the year or in 2015 after Apple can produce enough devices. In addition to a larger screen, both versions of the iPhone 6 are expected to feature a thinner profile, a faster A8 processor, and an improved camera. Update: As noted by a number of observers including The AAPL Tree, Apple's financial projections for the current quarter and statements by company executives during the most recent earnings conference call strongly point toward an iPhone 6 launch before the end of the quarter, which falls on September 27. Without an iPhone launch to provide a sales spike, it does not appear possible for Apple to meet its own projections for the quarter. I don't believe it. The new iPhone will come in September, as always..
Perhaps it's me, but it just seems silly to have your company look basically dead all year and have everything of any interest announced in one hit, when other companies LOOK like they are bringing new and exciting things out at many times during they year. Even if it was a 6 month gap, Spring and Autumn. as always. to note, of all the iPhones that have ever been, only two have launched in september. I still can't get over tis idea of keeping this design for larger models? As screens have grown into epic proportions, with 5.0 becoming the standard. Manufacturers are having to clear their phones from excess space wasters such as large buttons to allow maximum screen estate. Yet apple continue to use this out of date design and then use a smaller screen? They should have either placed the clunky button on another part of the shell such as the rear or the side and reduced the top bezel instead of sacrificing screen size. What is most ridiculous is the footprint of the phone can remain larger than it needs to be while attention is then paid to how thin the phone is? Is there something about skinny fit jeans at the apple campus we don't know about? Where pockets are very large and wearers dont mind a poke over from their pockets, but are worn by middle aged workers who wear their pants so tight that they cannot possibly squeeze a phone in their pocket that is a millimetre thicker? The last really interesting product Apple launched was the iPad over 4 years ago, arguably this was just a reworking of the technology from the the iPhone, that came out 7 years ago. With all the research Apple do, and all the money and resources they have, I'm really hoping they release a brand new product with some exciting futuristic technology. Incremental updates are great, but it's nice to be surprised every once in a while. It would also finally confirm that Apple are still a forward-thinking, ground-breaking company, even after the loss of Steve. Strong troll brah. We know what the new iphone will look like, we are playing with ios 8. The ipad will be same form factor as last year. That just leaves you with the watch. Will that be enough futuristic tech to get you excited? Whatever the size, I will be buying. As long as it is bigger. The day the 4" died. Finally! I predict this year apple will introduce a new iPhone. iPhone 6 and iOS8 in September as per usual. The October event is going to be the more interesting one though.